Who doesn’t love a good story? I know I do. Storytelling has been gaining in popularity in the business world. Following the trend, I’ve also been using stories to help clients understand user / customer experience better. A lot of times, I find that non-UX stakeholders find it more difficult to make sense of how a particular usability issue affects their bottom line. I’ve found that using stories that they can relate to helps them visualise the issues better. One of the stories that I like to use during my presentations of findings to clients is what I call the bucket analogy (originally mentioned that Steve Krug in his famous usability book, Don’t Make Me Think). The story goes something like this. Imagine you’re having a house party and have lots of guests coming over. Let’s say it’s 6pm on Saturday and you didn’t get a chance to clean your house. So you’ve got stuff lying all around the house. So you go ‘Oh well! I’m sure the guests won’t notice. At least, I’ve cooked some nice food for them.’ Now imagine each of your guests turn up with a bucket of sangria. Don’t ask why. They just do. It’s a sangria party. Since it’s their first time visiting your house, you decide to show them around. Unfortunately, the guest doesn’t see a toy car on the floor and slips on it. Luckily, you were there to catch them. But half of the sangria still manages to spill from the bucket. The guest is definitely showing signs of frustration now. Finally, the guest walks over to the kitchen, still carrying half a bucket of sangria. 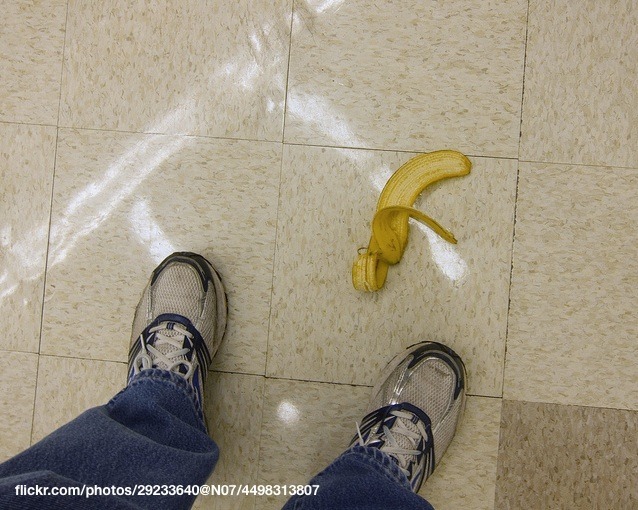 This time, they slip over a banana peel randomly left on the floor. This time, you weren’t there to catch their fall and they fall smack on their bum, spilling all the sangria. The sangria in the bucket is the confidence the customers have in your site. When customers visit your site for the first time, they come in with a bucket full of confidence. But the more hazards they comes across in your site or app, the more confidence they lose and eventually they fall flat on their face and leave your site. When I tell this story to clients, most of the time, they have an ‘Aha!’ moment. It helps them to experience the usability issues through the eyes of their customers. So sometimes, instead of saying ‘That’s a critical issue.’, I just go ‘Now that’s a few banana peels on the floor right there!’. What stories do you tell to make things clearer for your stakeholders to understand customer experience? This entry was posted in User Experience by Nirish Shakya. Bookmark the permalink.